Home » animal rights » Toronto Zoo Elephants Death by Dogma? Toronto Zoo Elephants Death by Dogma? Just what will the 4200km road transport of the Toronto Zoo elephant entail? Good question, sadly the transport plans appear to be top secret, FOIA is seemingly not available and the Zoo now refers any questions about the transport to PAWS. The Zoo’s CEO John Tracogna and zoo board chair Joe Torzsok clearly want to appease the will of council at any cost maybe at the cost of these elephant’s lives. Council rules supreme, they are accountable to no one but their own egos. There has been nothing stopping either of these individuals from speaking out to the media, to stand up and declare that they are against this transfer but must kowtow to the will of Toronto City politicians who have claimed control and power over the fate of these elephants. To protect their jobs or positions on the board and perhaps future career opportunities they have said nothing, absolutely nothing at all in defense of these elephant’s lives, in defense if the zoological expert opposition. Their sole mandate is to exercise the inhumane demands of the non-experts at Toronto City Council. How can you run a zoo when the welfare of the animals comes second to the needs of politicians? What we do know about the transport plan is that it requires one elephant on one flatbed truck with two others on another truck. Of course they will be chained on three legs in their crates but the trucks are not enclosed. The two elephants on one truck is of great concern, once again the Zoo’s CEO shows a total lack of knowledge, experience or seeming concern for the welfare of these elephants. He has been advised by his senior vet staff and the zoo’s animal care committee that this proposed plan is unsafe and inhumane. He went ahead and approved the plan against opposition from his entire senior staff and vets as well as industry experts. Because everyone knows politicians and anti zoo organizations are brimming with experience in zoological care and impartiality. The Toronto Zoo elephants are protected contact. 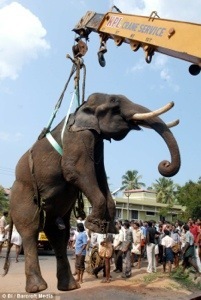 This means they cannot be loaded or offloaded in a manner lets say that circus elephants are, freely and at will. Once they are on the trucks they can only be offloaded safely at a secure facility which has the means to house them, both indoors and out. Generally this would have to be a zoological facility. Accommodating one elephant is reasonable three is another story. Since it appears Zoocheck cannot afford the air transport they promised as a means to acquire council votes and public approval to send these elephants to PAWS and they are undertaking the cheapest mode of transport possible do they have the money to pay a zoological facility the required fees if the need to offload arises? Or will they just drive non stop straight through? The crates will be exposed to the elements during transport. As the trucks drive into the cooler temperatures of the rocky mountain weather systems night time temps can go as low as 35° F/1°C. Whether or not there are heating and cooling systems in place is unknown as the plan has been kept a secret. The crates have slats which allow outside air to flow in and out so it seems any form of heating or cooling system would be pointless anyway. Now of course our elephants are used to colder temperatures but they are not used to having cold wind blasting on them as they travel down a highway at higher altitudes all the while having to flex muscles systems and strain their legs to accommodate the sway of the vehicles, acceleration and deceleration. Perhaps this would be easier on younger elephants or elephants trained to travel but training elephants to stand in a stationary crate in the psychological comfort of the home they have known their entire lives is no preparation for the rigours of real transport at any distance let alone 4200km. They will be scared, stressed and physically at risk as a result. This experience will be terrifying for them, fear increases stress and stress brings physiological risks in an elephant which can cause rapid death. Have you ever tried to save a baby bird? And despite all the efforts you took to help it it died within hours? This is because it is so terrified having been “captured” that it’s heart rate increases to lethal levels. This increases that lactic acid in the animals system and without the ability to reduce those levels it has deadly results. In the case of capture myopathy muscle tissues can be permanently damaged and its fatal results can occur immediately or within weeks. The best and sometimes only treatment for capture myopathy is prevention. It is common in wild animals but has been known to affect captive animals. In the case of the Storybook Zoo seal deaths during the Zoocheck initiated transport from London, Ontario to the St. Louis zoo it is thought that capture myopathy was the cause, the seals were young and healthy. Three out of the four perished, two in transport and one later at the zoo. Stress and fear killed them, transport killed them. In the case of the two older Toronto Zoo elephants Toka and Iringa, if one of them goes down during transport it is very likely it will never get back up again. 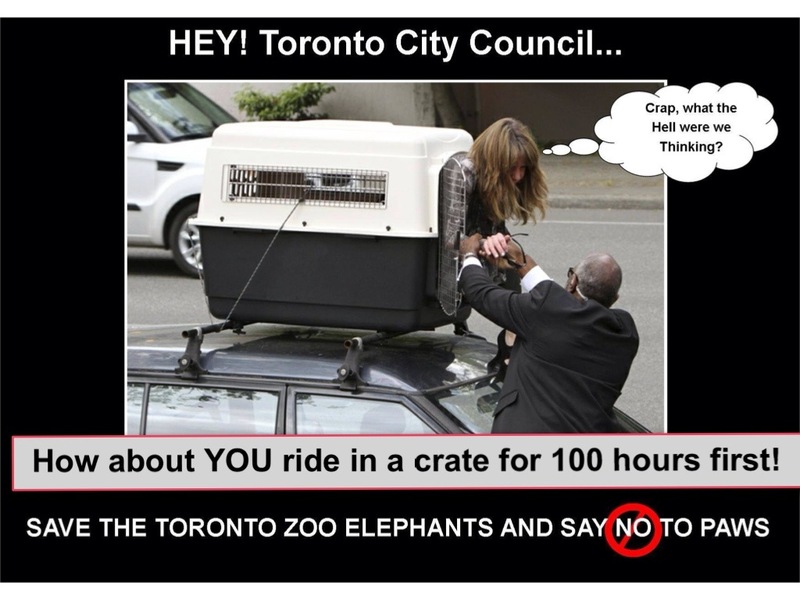 How the CEO of our zoo and Toronto City council can approve of this road transport is unimaginable. They cried animal welfare down at city hall, patted themselves on the backs as heros, they hailed “sanctuary” as the only answer for our elephants and ignored industry expert opposition. They ignored tuberculosis risks at the sanctuary and they denounced the 30hr road trip to The National Elephant Center in Florida as inhumane but in order to cater to their extremist dogma they silently approved of an 80+ hr transport as ok. How is 30hrs inhumane and 80hrs is not? Does the destination magically make the journey less deadly? Anyone who believes this is an extremist without the rational intellect to separate their cult-like beliefs from reality. Will this be the fate of Toronto Zoo elephants? Will Toronto City Council be held accountable if this happens? Could the last image of Toronto Zoo elephants look something like this? Who will they all blame? They will blame the zoo staff for delays, as if 2 years would have made the difference. Iringa, the oldest elephant could not have travelled by truck at all two years ago due to a foot ailment. It has only recently begun to heal thanks to the world class vet care at the Toronto Zoo. There was no transport plan two years ago, planes were promised and we now know they were never able to make good on this promise, ever! The road transport plan was just secretly agreed upon by Zoocheck and the Ceo in the early spring of 2013 when they realized the Royal Canadian Air Force could not compete with the commercial air transport offer Zoocheck and PAWS mysteriously turned down. 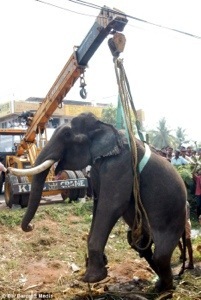 They did not have the common decency or concern enough for the elephants welfare to inform the elephant management staff in charge of training for transport that the mode of transport had been changed. They knew they were planning road transport as early as March 2013 and didn’t tell staff or the media until September, 7 months later! The new crates just arrived at the zoo at the beginning of September, 2013. The first crates were built incorrectly and the wrong size due to yet again more bungling by Zoocheck and Paws which had the incorrect measurements of the elephants. And of course to outline delays and who is responsible for them we could go all the way back to 2011/2012 and the lack of honest disclosure by Paws to the zoo and the people of Toronto about tuberculosis transmission on site and tuberculosis deaths at the sanctuary. The only people to blame in this fiasco are city councillors and the extremist animal rights egos of Zoocheck Canada and PAWS. 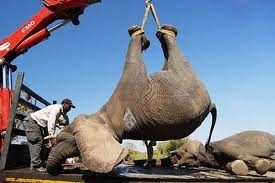 If these elephants die in transport Zoocheck will have a perfect record for animal deaths during transport. I wonder if they have an award for that? With the recent transport of a young bull from Calgary to Florida we have been able to determine a timeline for travel, how long the Toronto Zoo transfer might take. It is certainly not anywhere near the transport time they have been spewing to the media. The young bull, an experienced road transport traveller arrived at his destination in 75 hrs. This include multiple stops. Three older elephants with two on one truck means a considerably slower and longer drive. Flooding, forest fires and now the onset of an early winter in Colorado and Utah all come together to create what could now be a road trip which could exceed 100 hrs! 100hrs is humane according to City Council and animal rights groups. They will stop at nothing to get these elephants. Because our elephants are now poster children which represent a victory against zoos on behalf of the anti zoo movement. They are being used to promote a cause and their welfare is secondary to the cause, and that is what we call exploitation. Exploitation is the use of someone or something in an unjust or cruel manner. An advertising or a publicity program. By zoosmatter in animal rights, animal welfare, animals, politics, toronto, toronto zoo, toronto zoo elephants, zoos on September 24, 2013 . First of all I want to say that I COMPLETELY oppose this move. They should be going to Florida, for all the reasons listed above. I would like to mention that they WILL be making multiple stops to let them out and each stop must be for a set minimum time. The entire route and each stop is laid out meticulously. Again, that doesn’t make it any better really, since Florida is so much closer. Also, they could not fly to the California sanctuary since elephants can not fly at high altitudes. Therefore a plane carrying an elephant could not fly over the Rocky mountains. They could be flying to Florida though, which would be a faster means of travel and potentially less stressful. This entire thing is being handled horribly and the elephants will suffer for it. Shame on Toronto City Council. We agree! 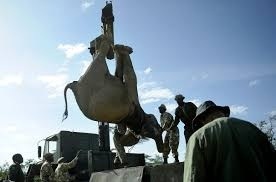 Plus there is 100% evidence that the african herd at Paws has been exposed to tuberculosis it is a travesty all around. If you live in Toronto please inform your councillor how you feel about this. They claim citizens support this transfer. Hey Zoos Matters how come you never join protests against circuses that truck their elephants all over North America. Why do you support Limba being trucked all over Ontario and Quebec for circus performances even after she had to be craned out of an overturned truck. 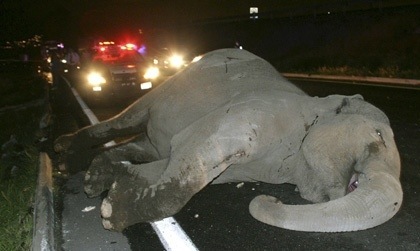 If you cared about these elephants you should be supporting their move to PAWS. thanks for evidencing what can happen when an elephant is transported by truck, accidents do happen. The circus doesn’t come to my town, PAWS has tuberculosis and a 4200km road trip is ludicrous. Limba is a healthy and well cared for elephant unlike the obesity seen in PAWS elephants. I made it my duty to visit with Limba and learn more about her, her life her individual personality and her care. I spent a great deal of time with her and her keeper and determined that Limba isn’t the “lethargic depressed” animal activists want people to believe she is. She is happy and healthy at age 50yrs. She is also in semi retirement if you actually knew the facts. The reason she is so healthy and in shape is because she works for a living. DO you think 50yr old elephants in the wild just stop working? stop walking? stop everything and stand around eating treats all day? No they do not, they keep going. Every animal has a right to be treated as an individual right? Limba is an individual with her own life history and her own personality, understanding that creates a better understanding that at age 50 she is fine right where she is. We dont lobby against the circus because we are doing this for OUR elephants, for Iringa Toka and Thika.This is why Zoos Matter formed, to fight for the Toronto Zoo elephants, it is Zoos Matter not Circuses Don’t Matter. We do care and we don’t want them dying in a truck or being exposed to TB. PAWS is unable to provide crucial tissue cultures for Ruby, an African elephant which died just three months after the source elephant in the TB transmission died (Rebecca) Her necropsy reports showed she had a bronchial mass on her lung at time of death. Can you explain why PAWS did not have those cultures done? Or cultures on 71 done? was it a financial issue? Doesnt matter why, those cultures needed to be done as Ruby had a high risk history of TB exposure. They knew they were going to lobby for the Toronto 3, a responsible facility would have ensured the cultures were done so that they could alleviate concerns with actual evidence and culture reports. They didn’t. SO the risk in that herd is unknown. If there is one thing I have learned from all of this is that the anti captivity dogma will not be debated with rationally or otherwise. We allow some comments in opposition here but as the antis of the world have literally hundreds of places to go vent their opposition I suggest you do this. and Steve who do you think has a better opportunity to aid in the quality of life for Limba? You or me? Clearly it is me, I have built a relationship based on cooperation and open mindedness with her owners. I can sit down and have a coffee and talk about ideas with them. You will never change anything because you have chosen and extremist point of view which keeps you on the outside looking in, doing nothing more than puffing up your own self importance, yelling at people and carrying a sign. Just as the campaigns of most animal rights groups do, lots of campaigning and raising money and very little actual change. I choose a moderate course of action which allows me to actively involve myself to affect the changes I believe in and to undermine the propaganda which people like yourself use to cloak yourself with, to better yourself with. I actually want to help animals and I will be able to do more to help animals in my lifetime than you ever will because sadly you blind yourself and stagnate your efforts with dogma. Wasted passion IMO. Who are you to make assumptions about whether we care or not? To assume you care more. You like hobnobbing with what you perceive as “celebrity” I could care less about who I impress or not, no one in our group cares about that. What we care about is not letting animal rights dogma supersede true animal welfare and true animal activism. You set aside your ideologies to achieve that goal in life for the sake of animals, humans, nature, habitats whatever your passion is. Otherwise it just becomes a game of us vs them with three elephants caught in the middle. I don’t take blame for that, that battle was created by yourself and the PAWS/Zoocheck supporters who have done nothing by malign and disparage the Zoo and its staff and anyone who opposes your belief system. It is awful. How do the zoos get the elephants to the zoos in the first place? Are they born there? What about to and from other zoos for breeding purposes? 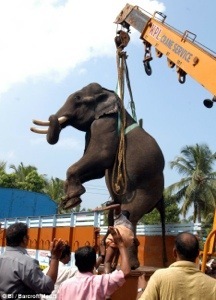 zoos do use road transport but they take into consideration individual elephant’s needs. For example two of our elephants are older and one, the oldest just recently recovered from a foot ailment. She does suffer from some arthritis and her vets do not believe she is physically fit enough to handle the transport. Remember when they are chained and immobile for that length of time they cannot move their limbs sufficiently to generate the proper amounts of oxygen, this can cause an animal to go into stress and collapse, once it is down during a road trip of this nature it is highly unlikely it will ever come back up again due to the restrictions there will be for proper vet care. Its not like just driving your pet to the vet obviously. Our elephants have been here almost their entire lives. The two oldest flew here as calves and the youngest was born here. None have any experience in road transport let alone 4200km. The longest they will stay in their crates right now without some kind of indication of panic is 20minutes. The goal of the AZA is to revamp their elephant exhibits so that ellies dont have to move anymore, so they can stay with their family groups as much as possible. The African Lion Safari in Ontario has one of the most successful herds in North American, right in the middle of a snow belt. But they have a large herd, a family and this is key to elephant happiness wild or captive. Moving older elephants is risky business, moving young elephants is easier and safer due to their younger fitness levels. This is horrible! Makes me wonder who is in the “pocket?” These elephants should stay where they are or be taken to Florida where there is no risk of TB.